Anirudh's World: Dancing a la Shahrukh Khan style! 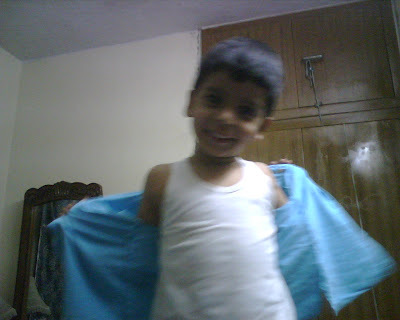 Yesterday night when I was getting Betu changed into his night dress, I asked him to take his shirt off. After opening the buttons, he stood still for a few seconds and was eying me in a very naughty expression. 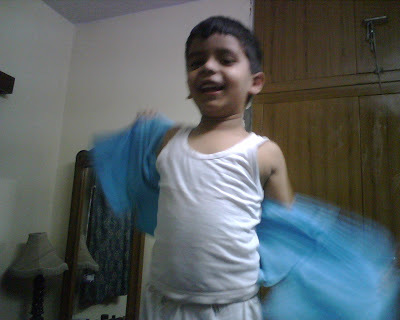 I was wondering why and before I could think too much or ask him anything he broke into the "Dard-E-Disco" dance (from the movie Om Shanti Om) opening his shirt wide and shaking his body just like Shahrukh Khan does in that song. HAhahahh ..I can imagine the scene :) So very cute ..lovely pics ! Ok now come to my page. Quick ! Got to tell ya somethin. That must have beeen so cute for sure. Pyaru betu!